Still more learning from the Black Panther movie. Looking at the incredible, strong, and confident characters from Wakanda, one can see what is possible for groups and individuals who grow up in a society where oppression does not exist. No one is left with the unconscious feelings of inferiority and self-doubt that come hand-in-hand with being treated as inferior, and no one is left with the unearned privileges and sense of entitlement and superiority that come with being a member of a dominant group. 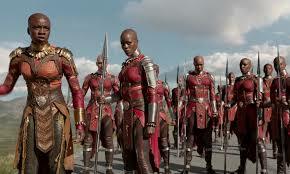 The women in Wakanda, in particular, are a stark contrast to the way women, and particularly Black women, are portrayed in the U.S. Rather than being second class citizens in any way, the members of the special forces group, the Dora Milaje, which consists of the nation’s strongest warriors, is made up of women only. Its general, Okoye, who heads not only this elite group but the entire nation’s armed forces and intel, is a woman. Another member of the Dora Milaje is Nakia, the Black Panther’s on-again, off-again girlfriend, who serves as a spy posted outside the country. While the women of the Dora Milaje protect the throne through martial arts, Princess Shuri, a young woman and sister of King T’Challa, protects and serves the nation with her capacity to create technology of all kinds. What each of these women share, and demonstrate, is self-confidence and independence. Also striking is the capacity of the men of Wakanda to work with and love these strong, intelligent, independent women without feeling a threat to their masculinity. What might our country look like if all children were brought up to believe in themselves and if all voices were heard? So what you’re saying is that the Dora Milaje was only effective because woman weren’t oppressed?! Really! So that excuses American black women as a general population not to be able to excel, not to join together for positive results and not to except any responsibility. That is ludicrous. Black women in America are fully capable and continue to out-perform black men in completing college. Are there still disparities? Yes, of course there are. Until people of color outnumber white people ( say by 2040), there will always be some racism. Racism within same groups exist as well, but racism by itself doesn’t automatically adversely affect success. I’m more concerned about the oppression of poor people by rich people. I don’t care about color. You see this nation divided by economics – those that have (blacks, whites, etc.) and those that don’t (blacks, whites, etc.). Yes there are disparities, but plenty of black people are rich and more than are poor – similar to whites. My problem is elitist – the feeling that people have that they are just better than anyone else. We see that every day. I fight that every day and think about how my grandfather was treated and how even I, after a Master’s Degree was treated disrespectfully by other people. A family member of mind who was a former principal in the Bronx believes this country is great ONLY because of the East and West coasts! people in the middle of this country don’t matter! Imagine his total elitism I argue with him on every visit. I guess he never heard of slave labor or immigrants or hard-working people of every color that helped build this country. It wasn’t Hollywood or Wall Street. Despite obstacles, we still can all succeed, but we need to take responsible for our actions. We can’t have single parents, unequal access to education (I favor the voucher system that allows choice) and this chip on the shoulder that seems to justify elitists that sweeping the street for a living is less valuable than a tycoon, thereby saying that equal treatment isn’t important. I find that repulsive. Thanks for your feedback – I want to respond but it’s been a crazy week – I’ll be back as soon as things settle down.